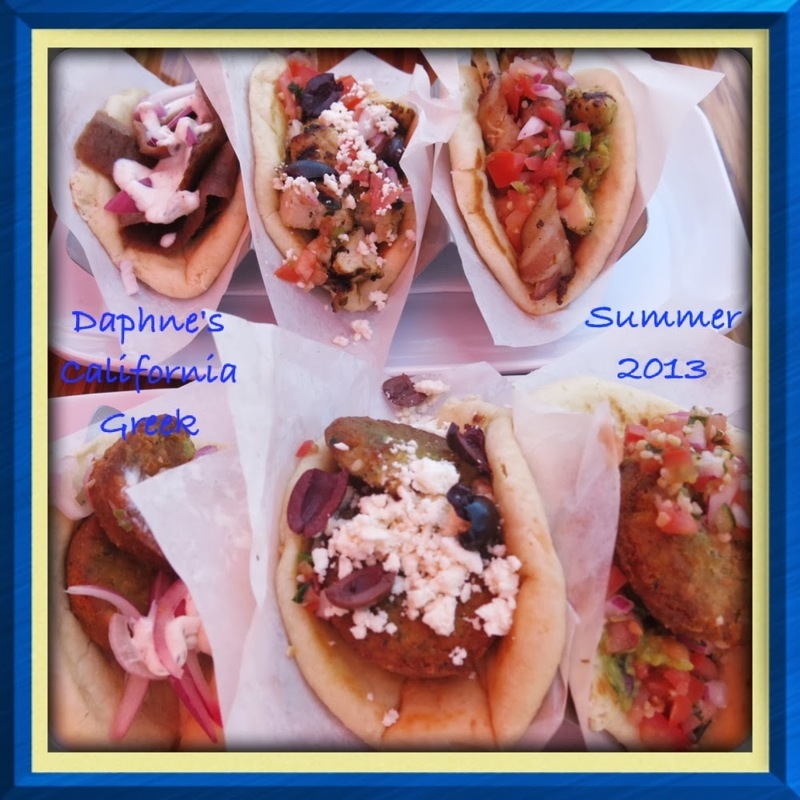 This last week I was invited to check out Daphne's CA Greek Cafe in Costa Mesa, to sample their new summer menu. I love Greek food and jumped at the chance. Though, I had my daughter with me and honestly I was a little nervous about wether she would like it or not. We were offered pita bread/chips to start off with. 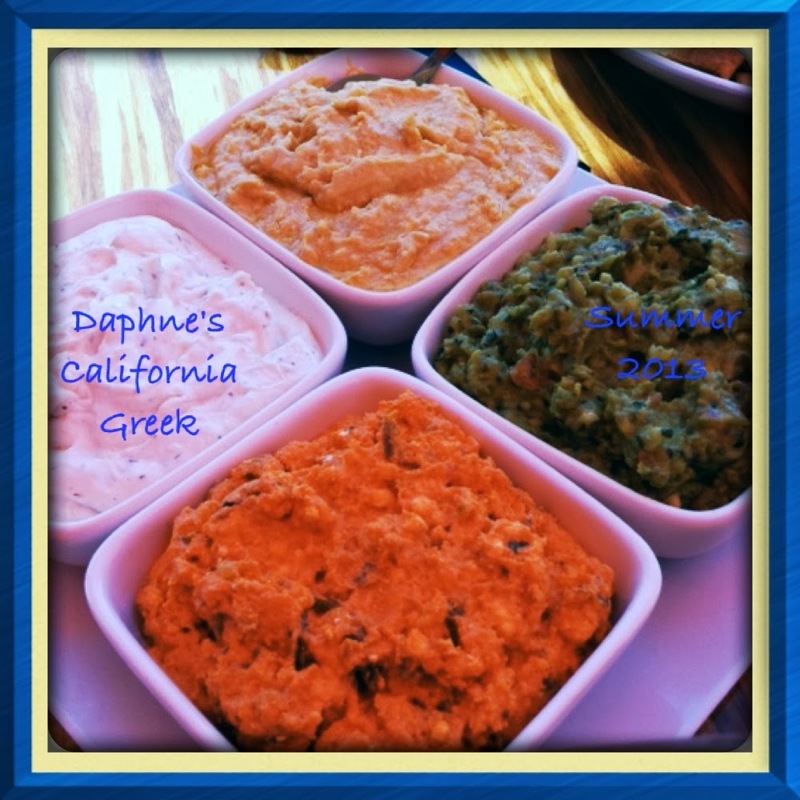 The dips included, traditional Greek yogurt, hummus, Greek guacamole, and a fiery orange dip that had just the right amount of burn called, fire feta. My daughter and I dug in. I am a huge fan of hummus and I wasn't disappointed. My daughters favorite was the guacamole or "locamole" as she called it. We went inside to get drinks and was drawn to the iced teas. We don't drink a lot of soda so we opted for the Blackberry Green Tea. It was perfect! It was light and flavorful and sent well with all of the courses we tried. My daughter asked for seconds. The next course we were offered was a Greek salad. I had the California Greek salad which included chicken but my table mate who was a vegetarian received it without the chicken but with extra avocado and greens. My daughter took a few bites but her mind was on the "locamole". The salad was not drowning in dressing but all the favors of the actual salad made it very flavorful and it wasn't necessary. The mini Pita Trio were next to arrive. Each pita gave a different distinct flood of flavors and left me pleasantly full. My favorite was the Cali- Greek Pita but the others were tasty as well. Greek Mini Pita: a Greek style pita sandwich with savory gyros, red onion, and tangy Tzatziki sauce. Cali-Greek Mini Pita: combines both flavor profiles into one pita sandwich. This mini-pita includes grilled chicken, Daphne's sauce, salsa Fresca, feta cheese, and Kalamata olives. California Mini-Pita: another pita sandwich with California flair featuring grilled chicken, Jalapeño bacon, and guacamole topped with salsa Frecsa. I was a little worried that my daughter wouldn't want to try the pitas but I needn't have worried. 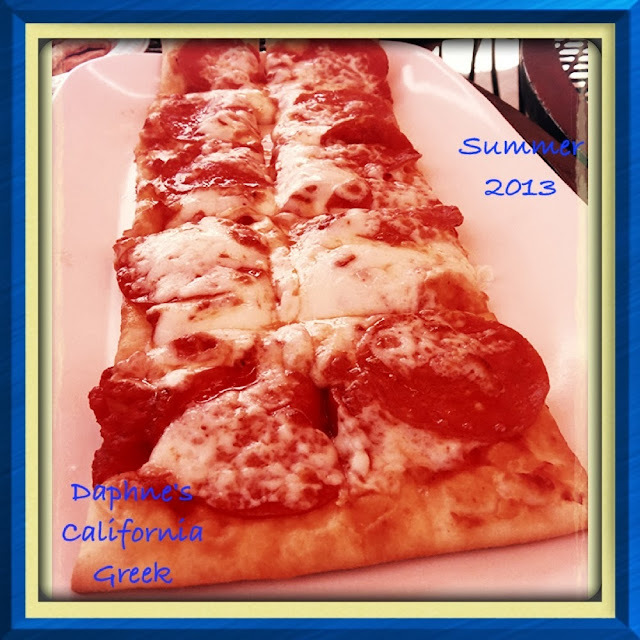 Daphne's also provided a sweet pita pizza for the kids that was gobbled up in seconds! You don't have to force your kids to try new foods but its nice to know I can get what I like and my children will have something familiar. My favorite course came up next. Yes, of course it was dessert! I have a horrible sweet tooth and my daughter is walking right in my footsteps. 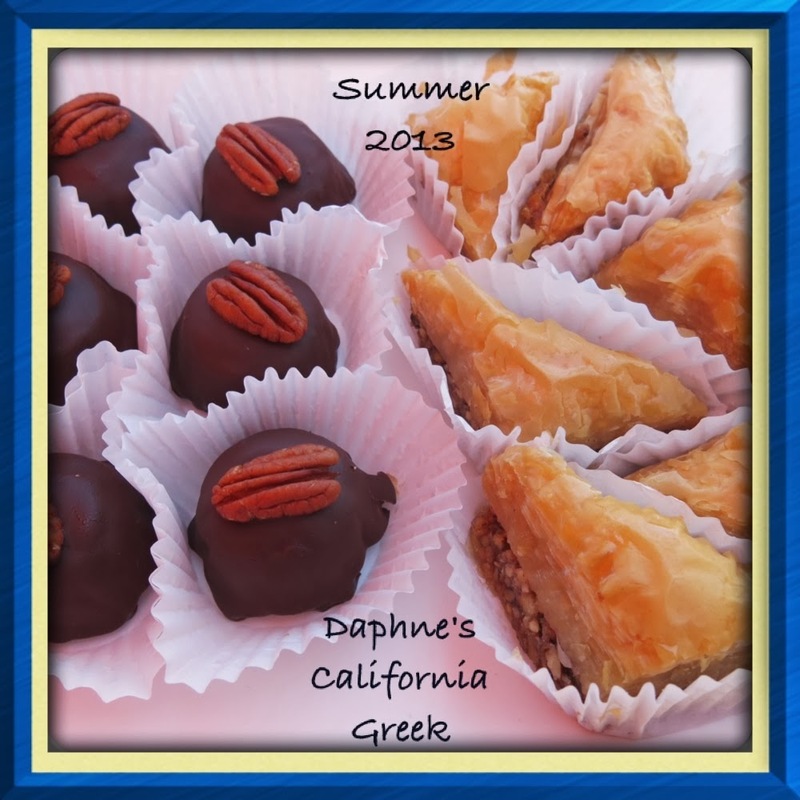 Dessert consisted of their Caramel Pecan sweet and Baklava which was light and crunchy. Our favorite was the caramel/pecan. Sweets win every time. I was really impressed by the vegetarian choices. I had the chance to see and hear first hand about tastiness of them as my table mate only received vegetarian choices. Many of the items included falafels. She couldn't say enough about the dishes. 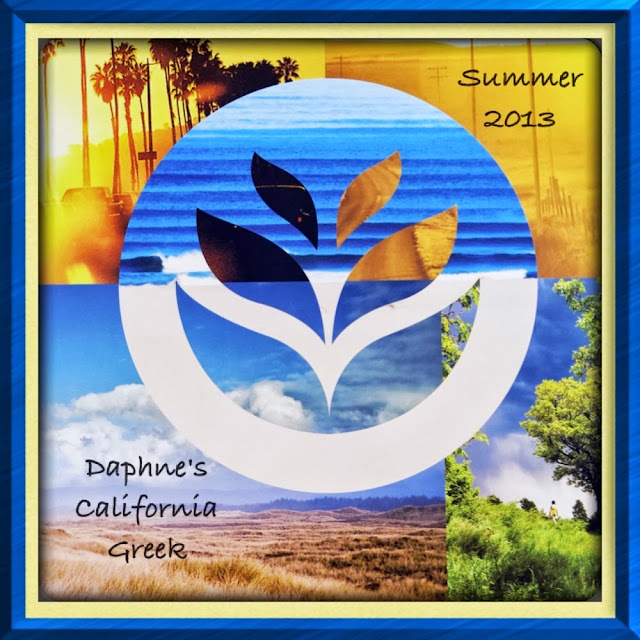 Founded in 1990 in San Diego as Daphnes Greek Cafe but became Daphne's California Greek in 2011 under new management. 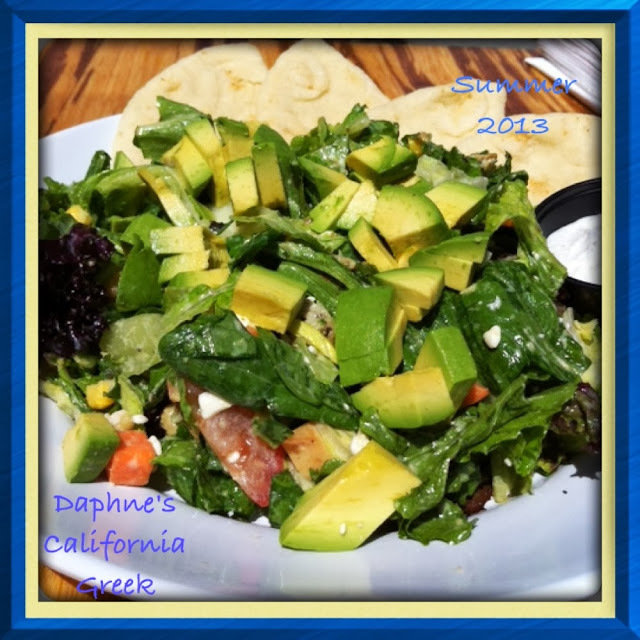 DISCLAIMER: I received lunch and a goody bag to sample and review Daphne's new Summer Menu. All thoughts are my own. Do not use any pictures without permission.